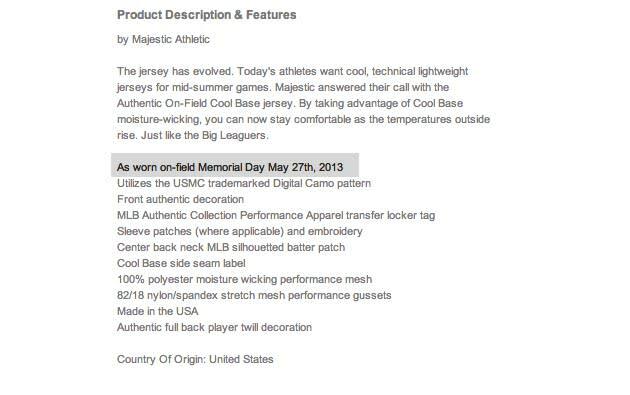 While it hasn't been confirmed yet by Major League Baseball, Paul Lukas of Uni-watch reports that every team will wear camouflage jerseys and caps come Memorial Day on Monday. 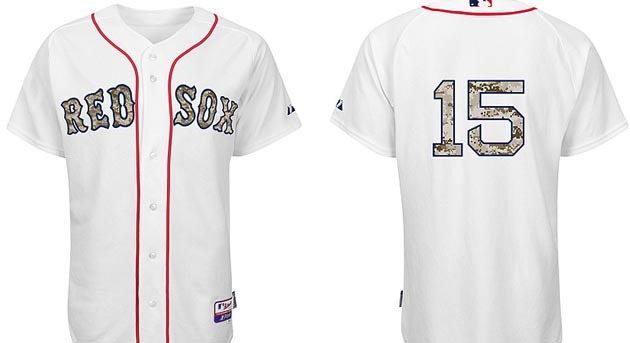 Lukas notes that replicas of the uniforms, which are on sale at MLB.com, appear to be similar to the camo colors the White Sox and Angels recently wore on Armed Forces Day. Memorial Day is not a day for celebrating the military. It’s a day for honoring the military dead. A more appropriate gesture would be an MLB-wide black armband. An even better gesture would be a pregame moment of silence, without anything on the uniform. But as is so often the case nowadays, merchandising and pandering trump common sense. I'm only guessing, but my grandfather probably would agree. He was among the Allied troops to risk life and limb on D-Day. He also knew the difference between Memorial Day and, say, Veterans Day. Grampa was funny; he didn't even like people to applaud the playing of the "Star Spangled Banner" because it was not to be viewed as a performance, like some kind of top 40 hit. So he was principled in his patriotism. Regardless that you might clap after the national anthem, it was something he put some thought into. As Lukas said, Memorial Day originated to honor men and women who died while fighting. I can't imagine Grampa would find it appropriate to be honored on Memorial Day because he didn't die until World War II had been over for 50 years. Now, there's nothing wrong with honoring the dead, and there's nothing wrong with honoring veterans. And there's nothing wrong with honoring the military. The San Diego Padres manage to be tasteful in doing so at Petco Park on a frequent basis. It's just disturbing how many people don't know what Memorial Day is for, and that they'll just mindlessly go along with anything that sounds remotely patriotic. Memorial Day has become a synonym for anything at all to do with " 'Merica," and it's a disgrace. MLB contributes to this cognitive dissonance by having the players wear these inappropriate jerseys. It makes it look like all they want to do is sell more merchandise. That's not the kind of message they want to project, I would imagine, even as they prepare to sell "stars and stripes" caps come July 4 and Sept. 11. Major League Baseball has long been a supporter of the military including active military, military families and veterans. 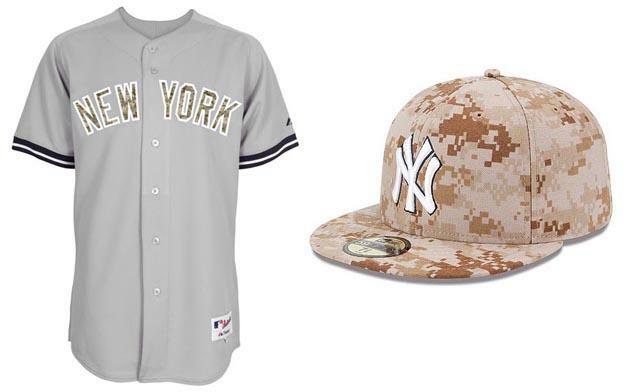 The camouflage caps and jerseys are being sold with 100% of MLB’s proceeds going to Welcome Back Veterans, a program which raises money to provide grants to hospitals and clinics that provide post-traumatic stress disorder (PTSD) and traumatic brain injury (TBI) treatment to veterans at university hospitals throughout the country. Welcome Back Veterans is funding programs at Weill Cornell in New York City, The University of Michigan, Rush University Medical Center, Duke university, Emory University, UCLA and the Boston Red Sox’ Home Base Program at Mass General Hospital in Boston. This program is part of $23 million commitment from MLB to Welcome Back Veterans since 2008. He also notes that a moment of silence is observed at each game played on Memorial Day, even if it comes in the middle of an inning. All good deeds, and all show that MLB has its heart in the right place when it comes to helping those who have served. Another step it could take that would help. Use the camo uniforms in another way. They shouldn't be worn Memorial Day. And for what? Not for what MLB would like us to think. Baseball is in full swing! Interact with@AnswerDave, @MikeOz, @Townie813 and @bigleaguestew on Twitter, along with the BLS Facebook page!